WHEN China sneezes, the rest of Asia — including Malaysia, which counts the Middle Kingdom as its largest trading partner — catches a cold. China has been under the weather for a while. Its economy has been slowing, with gross domestic product growth projected at 6% to 6.5% this year from 6.6% in 2018, so, Beijing has stepped in with a stimulus package of tax cuts coupled with monetary easing policies. Manufacturing data released last week appears to indicate that things are slowly taking a turn for the better in the world’s second largest economy. But not everyone is convinced that the stimulus aspirin is enough to ward off the flu. Socio-Economic Research Centre executive director Lee Heng Guie believes a stronger prescription may be required as contagion risks to Asia’s manufacturing sector remain. “Though the headline Purchasing Managers’ Index (PMI) numbers are above 50, I think it is too early to call it a turnaround. China has taken some steps [to stimulate its economy], such as cutting the reserves ratio requirement to provide more liquidity for its banks, but it all still goes back to the outcome of the US-China trade talks, which is still hanging [in the air],” he says. According to China’s National Bureau of Statistics (NBS), the manufacturing PMI recorded a reading of 50.5 in March, a recovery from February’s 49.2. 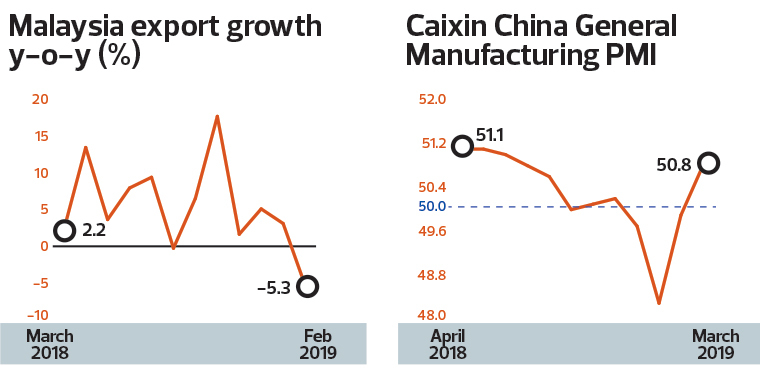 At the same time, the Caixin China General Manufacturing PMI reading of 50.8 was also an improvement over the 49.9 registered in February. Both indicators signal the first improvement in China’s manufacturing sector in four months. For clarity, a reading above 50 indicates expansion and one below 50 represents contraction. “The official PMI assigns a higher weight to state-owned enterprises while the Caixin PMI assigns a higher weight to small and medium-sized companies. The slight improvement in the PMI does suggest that China’s stimulus may be helping to arrest the decline in manufacturing activity and is reviving domestic demand,” says Maybank Kim Eng Research senior economist Dr Chua Hak Bin. JPMorgan senior economist for Greater China, Grace Ng, says the growth momentum in the Chinese economy appears to have stabilised going into early 2019, on the back of macro policy support, following a slump brought about by domestic deleveraging and trade tensions. “In addition, forward-looking indicators in the March PMI report, such as improving new orders, hint at further improvement in manufacturing activity going into the second quarter. “[Furthermore], an improving outlook on the US-China trade negotiations implies less near-term trade policy uncertainty for China’s export sector. This could help to support business sentiments in the near term. Taking all factors together, we have revised upward the 2019 GDP growth forecast for China to 6.4%, from 6.2% previously,” she says. Still, the bank’s chief economist for Asean, Sin Beng Ong, expects the trade spillovers to the region to be modest. “The two primary drivers of the expected growth lift in China, consumption and fixed investment, have limited impact on demand for regional exports to China. Consumption has a low import impulse, and fixed asset investment tends to be more commodity intensive. “For global capital expenditure, we remain hopeful that the second quarter of 2019 would provide evidence of stabilisation in the demand for capital goods, and we take comfort that the recent turn in the March new export orders across the regional bellwethers paves the way for a better 2Q2019. However, we remain mindful that, amid a slowing global profit cycle, the prospects for a strong capex lift in the second half of the year remain modest,” he says. Cazenove Capital Management global economist Janet Mui points to other more telling indicators to gauge if indeed there has been an improvement in China’s economy, including infrastructure spending. “Look for a turnaround in infrastructure spending because it feeds into the economy relatively directly and quickly, and it really drives the cyclical part of the Chinese economy. The recovery of infrastructure spending at the start of 2019 is consistent with the better PMI. In February, Malaysian exports fell 5.3% year on year, marking the steepest decline in exports since October 2016’s 8.46%. The contraction was mainly due to lower exports to Hong Kong, Indonesia, the US and Vietnam, according to the Department of Statistics Malaysia (DOSM). DOSM data also shows that China remained a major trading partner, constituting 16.6% of total trade for January and February. 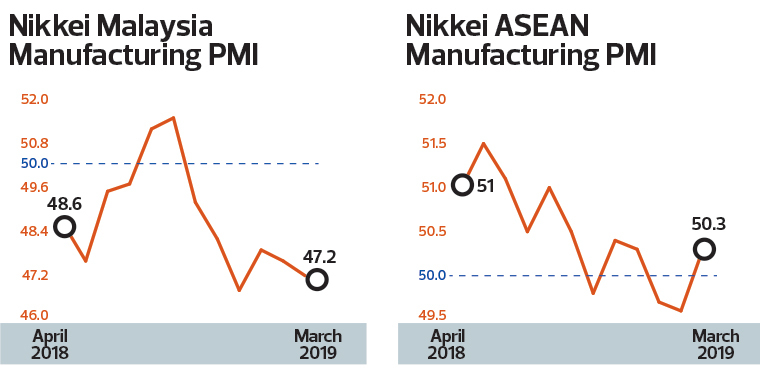 Manufacturing activity in Malaysia has slipped, with the headline Nikkei Manufacturing PMI registering 47.2 in March, down slightly from February’s 47.6, as factories report increasing business headwinds. However, it is worth noting that Singapore charted PMI readings that were in line with China’s, edging up to 50.8 in March from 50.4 in February. This was released by the Singapore Institute of Purchasing and Materials Management. Even so, UOB Malaysia senior economist Julia Goh views the uptick in Chinese PMI as the silver lining in a dark cloud given that other global indicators did not impress. The Baltic Dry index slumped 34.7% year on year in March, global semiconductor sales fell by slightly over a tenth year on year in February, and global trade was flat in January. “Alongside signs of constructive US-China talks, this could help Malaysia’s exports and industrial activity turn the corner in 2Q2019,” she says in a client note. The spotlight now falls on the outcome of the protracted Sino-US trade war. US President Donald Trump recently indicated both nations are close to a trade deal that could be announced within four weeks. However, risks to that could come in the form of a ferocious 280-character tweet from the unpredictable and capricious Trump. Even so, the self-proclaimed “tariff man” had raised hopes when he stated that a deal — if it happens — would be “epic” , “historic” and “the grand daddy of all of them”. Indeed, that would be the best tonic for China, and the rest of Asia, for that matter.